This is the default storage for AcitveMQ 5 and above. The AMQ Message Store is an embeddable transactional message storage solution that is extremely fast and reliable. message commands are written to a transactional journal - which consists of rolling data logs - which means writing is extremely fast and the state of the store is easily recoverable. 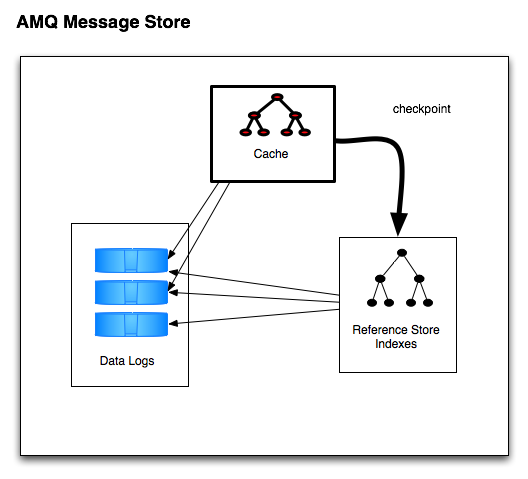 Messages themselves are persisted in the data logs of the journal - with references to their location being held by a reference store (by default Kaha) for fast retrevial. References to messages are held in memory, and periodically inserted into the reference store to improve performance. The messages are stored in data logs, which are individual files, typically 32mb in size (though this is configurable, they can be larger if the size of a message is large than the file size). When all the messages in a data log have been successfully consumed, the data log file is marked as being ready to be deleted - or archived - which will happen at the next clean up period. The above shows the configuration required to set the AMQ Store through its amqPersistenceAdapter - and explicity setting the directory and maxFileLength properties. 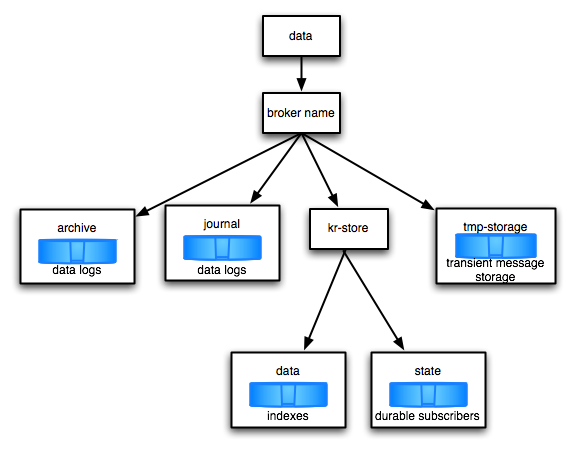 the message broker’s name is used to distinguish its directory of message data. By default, the broker name is local host. message data logs are moved here when they are discarded. use to hold data files for transient messages that may be stored on disk to alleviate memory consumption - e.g. non-persistent topic messages awaiting delivery to an active, but slow subscriber. If the message broker does not shutdown properly, then the reference store indexes are cleaned and the message data files (which contain messages/acknowledgements and transactional boundaries) are replayed to rebuild up the message store state. It is possbile to force automatic recovery if using the Kaha reference store (the default) by deleting the kr-store/state/ directory.